We will experience only a partial solar eclipse here in Western New York, but it should still be impressive. 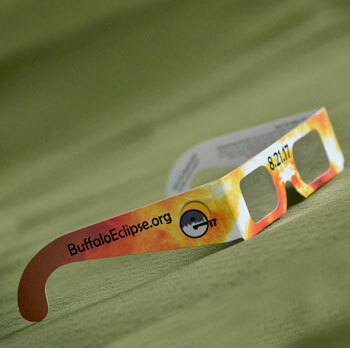 “If it’s a nice sunny day, you’ll definitely notice it,” said Gene Timothy of the Buffalo Astronomical Association. He is co-director of their observatory at Beaver Meadows in North Java. The eclipse will occur here on Monday, Aug. 21. It will happen gradually over a period of 2 hours and 39 minutes. The moon will begin to cover the edge of the sun at 1:11 p.m. The maximum eclipse for us, when 77.4 percent of the sun is covered, will occur at 2:33:55 p.m. The partial eclipse will end at 3:51 p.m. Even if the weather is cloudy, you’ll notice a difference, Timothy said, because the moon is solid, not semi-transparent the way the clouds are. It will get darker out, as if a storm is coming. But don’t stop weeding and look directly at the eclipse– The sun won’t be fully covered and you’ll hurt your eyes. You can also use the safe methods described here for viewing the eclipse. UPDATE: The Buffalo Astronomical Society has run out of the special sunglasses for the eclipse. You can find a wealth of information about the eclipse in our area at BuffaloEclipse.org. In addition, get a preview of the eclipse during the Eclipse-O-Rama to be held by the Buffalo Eclipse Consortium from 11 a.m. to 3 p.m. Saturday, Aug. 19 at the Buffalo Central (Downtown) Library, 1 Layfayette Square, Buffalo. It is free and will include demonstrations, games and activities for adults and children. How will partial eclipse affect our gardens? “It won’t do much,” said SaraJane Gomlak-Green, Science Communicator/School Programs Manager at the Buffalo Museum of Science. Even when there is a total eclipse of the sun, the totality lasts only a few minutes, she pointed out. For a partial eclipse, the darkness will be similar to what we experience on a cloudy day. Scientists are gathering data on clouds and air temperature during the eclipse and you can help. NASA invites you to collect data on clouds and air temperature and report it using your cell phone. Buy a thermometer now so that you’re prepared to gather data. You’ll also need an app called GLOBE Observer that you can download here. Not only can you use this app during the eclipse, you can use it at other times to contribute information about clouds. The same app gives you access to Mosquito Habitat Mapper, which asks you to identify potential breeding sites for mosquitoes, sample and count mosquito larvae, and with optional equipment, examine and photograph a specimen to identify its genus. Future versions of GLOBE Observer will add additional tools for you to use as a citizen environmental scientist. If you’re not amazed by our partial eclipse this year, just wait seven years. On April 8, 2024, Buffalo will experience a total eclipse, Timothy noted. Many enthusiasts like to experience a total eclipse where there are clear skies, and the chances of Buffalo having a clear day in April are slim, he said. So whether you want to experience a total eclipse in your own backyard or travel to an area that has a greater chance of sunny skies, mark your calendar. I love this information. I can’t wait for me and the kiddos to help gather data – I think they would get a kick out of it! Thanks Connie great information ….